Déjà Vu is the second album by trio Crosby, Stills & Nash, and their first as a quartet with Neil Young. It was released in March 1970 by Atlantic Records, catalogue SD 7200. It topped the pop album chart for one week and generated three Top 40 singles: "Woodstock", "Teach Your Children", and "Our House". It was re-released in 1977 as SD-19188 and the cover was changed from black to brown. In 2003, the album was ranked #148 on Rolling Stone magazine's list of the 500 greatest albums of all time. Certified septuple platinum by RIAA, the album's sales currently sit at over 8 million copies. It remains the highest-selling album of each member's career to date. Déjà Vu was greatly anticipated after the popularity of the first CSN album. Stephen Stills estimates that the album took around 800 hours of studio time to record; this figure may be exaggerated, even though the individual tracks display meticulous attention to detail. The songs, except for "Woodstock", were recorded as individual sessions by each member, with each contributing whatever was needed that could be agreed upon. Young appears on only half of the tracks, and drummer Dallas Taylor and bassist Greg Reeves are credited on the cover with their names in slightly smaller typeface while Grateful Dead guitarist Jerry Garcia plays pedal steel guitar on "Teach Your Children" and former Lovin' Spoonful leader John Sebastian plays harmonica on the title track. Four singles were released from the album with all but the last, "Carry On," charting on the Billboard Hot 100. The song "Country Girl" by Young is a suite put together from three song fragments entitled "Whiskey Boot Hill," "Down Down Down," and "Country Girl (I Think You're Pretty)," and is so identified in the credits. The popularity of the album contributed to the success of the four albums released by each of the members in the wake of Déjà vu – Neil Young's After the Gold Rush, Stephen Stills' self-titled solo debut, David Crosby's If I Could Only Remember My Name, and Graham Nash's Songs for Beginners. In 2003, the album was placed at number 148 on Rolling Stone magazine's list of the 500 greatest albums of all time. The same year, the TV network VH1 named Déjà vu the 61st greatest album of all time. The album ranked at #14 for the Top 100 Albums of 1970 and #217 overall by Rate Your Music. The album was issued on compact disc a second time September 6, 1994 after being remastered from the original tapes at Ocean View Digital by Joe Gastwirt. In 1997 guitarist Fareed Haque covered the entire album in jazz form for the Blue Note Cover Series. 5. "Everybody I Love You"
David Crosby – vocals all tracks except "4+20"; rhythm guitar on "Almost Cut My Hair," "Woodstock," "Déjà vu," "Country Girl," and "Everybody I Love You"
Stephen Stills – vocals all tracks except "Almost Cut My Hair"; guitars all tracks except "Our House"; keyboards on "Carry On," "Helpless," "Woodstock," and "Déjà Vu"; bass on "Carry On," "Teach Your Children," and "Déjà vu"; percussion on "Carry On"
Graham Nash – vocals all tracks except "Almost Cut My Hair" and "4+20"; keyboards on "Almost Cut My Hair," "Woodstock," "Our House," and "Everybody I Love You"; rhythm guitar on "Teach Your Children" and "Country Girl"; percussion on "Carry On" and "Teach Your Children"
Neil Young – vocals on "Helpless" and "Country Girl"; guitars on "Almost Cut My Hair," "Helpless," "Woodstock," "Country Girl," and "Everybody I Love You"; keyboards, harmonica on "Country Girl"
Dallas Taylor – drums all tracks except "4+20"; tambourine on "Teach Your Children"
Greg Reeves – bass on "Almost Cut My Hair," "Helpless," "Woodstock," "Our House," "Country Girl," and "Everybody I Love You"
Jerry Garcia – pedal steel guitar on "Teach Your Children"
John Sebastian – harmonica on "Déjà vu"
^ Eder, Bruce. "Déjà Vu". AllMusic. Retrieved September 25, 2018. ^ Winner, Langdon (April 30, 1970). "Crosby, Stills, Nash and Young Deja vu > Album Review". Rolling Stone (57). Archived from the original on 2008-06-21. Retrieved 21 June 2008. ^ Christgau, Robert (May 28, 1970). "Consumer Guide (10)". The Village Voice. Retrieved October 11, 2017 – via robertchristgau.com. ^ "NEIL YOUNG, BOB SEGER and CROSBY, STILLS, NASH & YOUNG.....USA album sales". Greasy Lake Community. ^ Zimmer, Dave, and Diltz, Henry. Crosby, Stills & Nash: The Authorized Biography. 1984, ISBN 0-312-17660-0, p. 115. ^ Levy, Joe; Steven Van Zandt (2006) . "148 | Déjà vu – Crosby, Stills, Nash and Young". Rolling Stone's 500 Greatest Albums of All Time (3rd ed.). London: Turnaround. ISBN 1-932958-61-4. OCLC 70672814. Archived from the original on 28 April 2007. ^ "Australiancharts.com – Crosby, Stills, Nash & Young – Deja vu". Hung Medien. Retrieved September 13, 2017. ^ "Official Albums Chart Top 100". Official Charts Company. Retrieved September 13, 2017. ^ "Crosby, Stills, Nash & Young Chart History (Billboard 200)". Billboard. Retrieved September 13, 2017. ^ Déjà Vu – Crosby, Stills, Nash & Young > Charts & Awards > Billboard Singles at AllMusic. Retrieved 19 November 2004. ^ "French album certifications – Crosby, Stills, Nash & Young – Déjà Vu" (in French). Syndicat National de l'Édition Phonographique. Retrieved 1 October 2012. ^ "Gold-/Platin-Datenbank (Crosby, Stills, Nash & Young; 'Deja Vu')" (in German). Bundesverband Musikindustrie. Retrieved 1 October 2012. ^ "The Official Swiss Charts and Music Community: Awards (Crosby, Stills, Nash & Young; 'Déjà vu')". IFPI Switzerland. Hung Medien. Retrieved 1 October 2012. 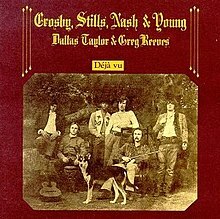 ^ "American album certifications – Crosby, Stills, Nash & Young – Deja Vu". Recording Industry Association of America. Retrieved 1 October 2012. If necessary, click Advanced, then click Format, then select Album, then click SEARCH. This page was last edited on 7 April 2019, at 01:33 (UTC).